Yes in fact today's cars are vastly easier to drive. 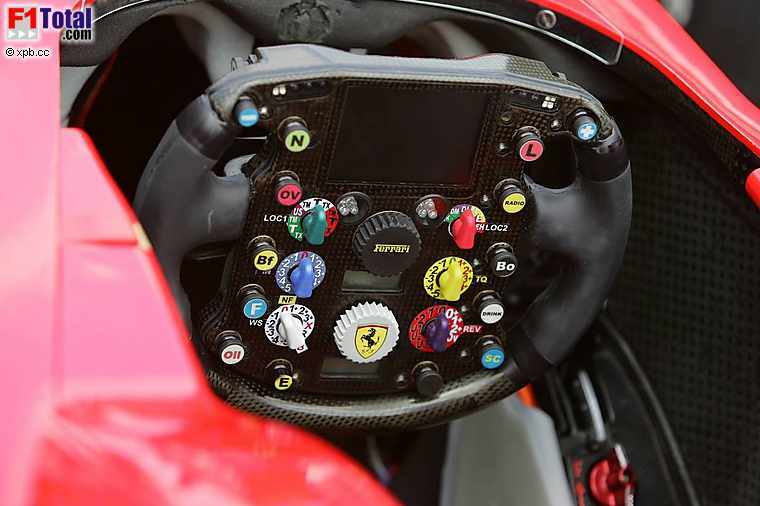 The most difficult aspect of driving the moder F1 car is the distraction from all the nicknack trinkets adorning the steering wheels which oh yeah, make driving the cars easier. As well Michael didn't have traction control his entire career and he still was lights out faster than anyone else. Today drivers can literally fine tune performance with buttons and nobs, where as before drivers had to learn to adjust their actual driving to overcome issues they ran into. As well, it's a slight misconception in that those supposed archaic engines were slower than today's engines because the speeds are greater today than they were back then. You have to keep in mind that suspensions back then were far simpler and less advanced and the power delivery of those engines was BRUTALLY INSTANTANEOUS and unforgiving and the current PU's with all their bells and whistles, while offering more torque, deliver that power in a vastly more controlled manor, thus making driving easier today. They might not have traction control, but modern engine mapping can do wonders in seemingly unlimited ways. Add to that current aero and it makes the job even easier because the threshold for forcing a car loose is a good bit greater. All you need in order to realize that is compare how often drivers go onto the green stuff without losing it as compared to previous eras. If the current cars delivered all their power to their maximum capacity immediately upon throttle input guys would be slamming into walls at every single race. "On Paper" power is vastly different to actual application and delivery of power. Please explain exactly why Massa has to do anything to "look better" for anyone. He is retiring, his record is available for all to see, he has no future in Formula One. You are basing your comment on the belief that Massa is vindictive and petty, making these comments to somehow impress ... WHO? You don't seem to know the guy at all. Let me give you some information. Massa is considered the "nicest" driver in the paddock, he wears his emotions on his sleeve, has never displayed a hidden agenda, and including being a very good family man, a true Brazilian hero. Firstly I disagree with the poster you're replying to, I don't see anything in there which would imply he's saying Lewie you're not the best. He says he's at a level similar to Schumacher & Alonso, and says they are the top 3. If that's his idea of an insult or a dig, he needs to get practicing his insults. But as for a reason for an elite-level competitor sportsperson to 'look better' for anyone? Ego. Their own self-belief and self-worth. Habit. Yeah it's a bit of a strange read by Bentrovato. Which was what I originally said about Massa so why the need to drag how I happen to compare drivers into this? Not agreeing or disagreeing with you here, just worth pointing out that a blog written by someone describing themselves as an "ordinary fan" probably isn't a source that would win most arguments. That's out of date now in regard to the 2017 cars, interesting how easy to drive were the Red Bull cars 2010-2013. So you think a 2016 car is not a modern car compared to a mid-90's car? I'd be more interested in how much easier it is to drive a Merc in 2017 then a Sauber as an example? To judge different regulations is probably impossible, but a belive that it gets easier and easier is perhaps a probability? Easier remains to broad. I agree with the article above, and would also add a few. Absolute focus and mental stress every day of a race weekend - early F1 up to and including the 70s, with the constant threat of death. Physically demanding - those 80s monsters. Multitasking with so many different inputs to maximise lap time - today's cars. There is no easier. There is different types of difficulty. I was talking about the physical aspect as explained by Brundle. Maybe you should have made it clear then. How do you want me to understand that you are talking about Brundle's part of the physical aspect of the cars from your bolded bit above? Yeah I perhaps jumped the gun on that one maybe the slight should be more about the V8 engines? That link by Abulafia is the same Abulafia who used to post on this forum, he's extremely knowledgeable on technical driving matters, in ways that made my draw drop. Is he still around? - The 2006 cars were easier to hit the max performance level than the '10-'13 cars were, and therefore really showed the speed differences of the drivers more. - Felipe is a "head driver", his performances vary greatly on how confident/happy/supported he feels. He had all the support in the world in 2006 and was under the tutelage of a teammate he often refers to as his "teacher", but was really getting his head done over by Alonso's politics during the '10-13 run. - He hadn't quite peaked yet in 2006, although he had come a long way from his banzai driving style at Sauber and really became much more settled with his driving. He was certainly a good performing version of himself that year, if not quite his peak of 2007-8. The list isn't exhaustive, but all that being said, MS in 2006 was miles ahead as a driver than FA of '10-'13, if the intricacies of those respective seasons were any gauge. I think Massa keeps getting that completely wrong. ... And yet he got beaten by the Fernando Alonso of 2006, so are you saying that Alonso actually got worse between '06 and '10? Frankly, I'll trust Massa over you. He's actually driven against both of them, in the same car, and seen everything there is to see about both drivers. Rosberg's average gap was worse to Webber than to Hamilton, but I don't think anyone would assume that Webber was the better driver of the two. You're making the mistake of thinking that someone is saying simple teammate comparisons give an idea of a driver's level, which tells me you didn't absorb the dialectic of my post. It's a common consensus that 2006 was Alonso the best performing driver that year, but looking the details throughout the season it looks so different, to the point where Michael Schumacher was head & shoulders above Alonso. 1) Australia 2006, when MS crashed out. When a driver is trying to compensate for a slower car to keep up with somebody extending his lead in the championship with his faster car or lose sight of them altogether, they have to drive in a different way than if they were up front. They have to ride the edge of the limit in a way the frontrunner doesn't have to. MS was 5th at the time he crashed and was trying to salvage one extra point by attacking Button before the end of the race. It was the 3rd race into the season and Renault and Alonso were appearing to run away from him. 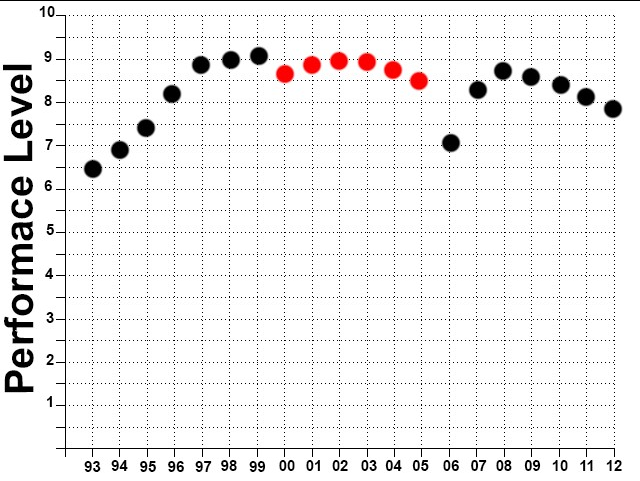 Therefore the driving style rides the edge more than Alonso cruising for his 28th point out of 30. And when you drive like that, you are more open to these incidents than Alonso. Defending a points lead is safer than catching up a deficit. 2) Another factor in the 2006 battle the notion that "Renault was faster in the 1st half of the season, Ferrari was faster in the 2nd half, so all in all they had about the equal best car in 2006. The tyre war made the difference for Alonso. In 2006 you had some circuits which turned out to be "Michelin circuits" and others that were "Bridgestone circuits". Where MS had to overcome the advantage that Alonso had, particularly in the early half of the season, he had to contend with Fisi, Button, the McLarens and to an extent the BMWs to come home as close to 2nd behind Alonso as possible. At Bridgestone circuits, Alonso only had Massa to overcome, as the other Bridgestone runners were too far away to threaten him. MS had some real battles with Michelin runners to get to Alonso, such as getting past Kimi at Silverstone while heavy on fuel (I'll get onto this in a moment), and was losing out in Oz and Malaysia, to name two. Another example of having an "extra level" is Imola. His tyres had graining issues and showed some out of the box thinking that made MS have the reputation he had. What he did was play "the wounded animal", and hobbled along even slower than what he was capable of, but was actually conserving what little his tyres had (and probably a little extra fuel) for a bansai stint. He played so wounded that the lapped cars he and Alonso had passed, had began catching up to them again! MS wasn't in that bad shape, but played it beautifully and forced Renault to pit FA early, then MS immediately stepped on it with his conserved tyres and any saved fuel and managed to keep his lead after the stint, then defended the rest of the way home. That's what for me made MS far superior that year. "Did you see what Michael did?". I believe he also break-tested a Torro-Rosso at Hungary, blamed his team at China . He was cracking pretty hard towards the end. It's things like that which showed an "extra level" that made Schumacher's season performance better than Alonso in 2006. Again, did Alonso show anything like the level of playing the wounded animal, or a heavy fuel pit overtake? He showed nothing like that level of extra performance. Don't get me wrong, Alonso is good, really really good, but he never demonstrated having something of an "extra genius" in his talent like Schumacher showed, that what made MS have the career reputation he has. Only in 2012 he come close to this, but not 2006. Alonso rather stumbled over the finish line in 2006 akin to Button in 2009. 5) The notion that the engine blow up was cancelled out by FA having a blowup at Monza. It didn't. In real points terms, FA's blowup cost him 6pts retiring from 3rd, maybe 8pts depending on your opinion of his qualy penalty. Schumacher's blowup cost 19 points, and therefore the championship. It lost 12 points to Alonso in japan (-10 MS, +2 FA), and the new installation in Brazil is what hit MS's qualy. That Suzuka blowup cost him an almost certain win in Brazil, going by Massa, so that was another -5MS, +2FA). There might have been some variance in the Brazil result, such as FA pushing Massa, but the point is the engine blowups definitely didn't cancel each other out, and that's why the misfortune was decisive. It was also misfortune in the sense that it happened on a Ferrari car, which had a record breaking reliability record in that era. One may not be shocked to see a Renault blow up, but for a Ferrari to blow up, and at that point in the season, was what made it bad luck. OK I'll stop typing, I'm sure there is more detail but that will do for now: TL;DR, Michael Schumacher was the vastly superior driver in 2006. Add to that that MS was 37 and admitted his "batteries on empty" while Alonso was 25 and hungry, they are on different levels, with Alonso a tad overrated and MS underrated. That was a good post mate! Is myattitude a Schumacher fan? I really can't tell. Can we have a counterpoint from a one eyed Alonso fan now? Hardly an objective analysis! I mean, I think he's wrong, but I'm nowhere near the level that would be required to write a counterpoint in the same vein. Too many ad-hominem replies. I'm happy to discuss the details with anybody as long as they play the ball rather than the poster. I'm a close study of that season and am confident in my understanding of the dynamics involved. Mainstream F1 media was writing the 2006 title battle completely wrongly (most likely for commercial reasons) and people have just rather followed that narrative ever since. So I'm happy to do my part to rectify some of that history with some more analysis of the details of that season and what was actually taking place. I think at the very least, Michael being the better driver, has earned that right (as any season best driver deserves to be recognised as such). And of course, that means Massa's recollection is incorrect, and doesn't match up with his own performances against Schumacher vis a vis Alonso. Exediron says he'd rather trust Massa than me, and that's fine, but that's an Appeal to Authority. I can refer to Pat Symonds, who says Michael Schumacher is faster than Alonso, more determined than him, and a better team leader: https://www.motorsportmagazine.com/arch ... her-alonso. Schumacher is not only better than Alonso, but better by a good measure. I believe he remained on a two-stop and the problems began after his first stop at around lap 20. There was only one, and my reply to it. And in all honesty, I think there is plenty to attack about your post in terms of objectivity. Many of the points you raise in favor of Schumacher are complete intangibles - you think he was capable of an extra level and say Alonso never was, but there's plenty who'd disagree with that, and I'm certainly one of them. Additionally, the idea that Schumacher was driving his car on the limit and making more mistakes while Alonso was in 'cruise and collect' mode is something that's been around since 2006, used by Schumacher fans to attack Alonso, and doesn't have an ounce of truth in it (in my opinion). Offering that sort of factually unfounded one-sided argument is why people might have felt your post was less than objective. Appeal to Authority is only a logical fallacy in scientific discussion (which this isn't) and if the authority being mentioned doesn't have superior knowledge to the people involved in the debate. Whatever you observed during the 2006 season, Massa saw more, and he knows more about Schumacher and Alonso than you possibly could. “Fernando was incredibly competitive, had the same total self-esteem of Ayrton and Michael. They know they are the best. He was a great racer, not quite as outright quick as Michael, maybe, but still very, very quick. At the times I worked with them I’d say Michael was the quickest, then Fernando, then Ayrton. But it was Ayrton’s first year and I’m sure people that worked with him when he was winning championships would disagree with that assessment. I've bolded the bits that could be taken as comparative. In the first paragraph he does say that Fernando was not quite as quick as Michael - maybe. There's three qualifiers in that: first he says not quite as outright quick, which has two right there (not quite meaning he was very close, and outright quick meaning that he may have been quicker in ways other than outright speed). Then he adds maybe, indicating that it's not meant as a firm assessment at all. Furthermore, Symonds worked with Alonso only up until 2009, whereas he worked with Michael throughout his entire career. You started this debate by specifically stating that Michael in 2006 was better than Alonso from 2010 to 2013, a period Symonds has no personal experience of and isn't talking about. In the next paragraph, he does certainly say that Alonso isn't the team player Michael was. I don't think anyone would question that statement, and I'm not about to: if Alonso was able to pull a team together around himself the way Michael could, he'd probably be somewhere around a four or five time world champion right now (2007 and 2008 at least, and probably more later). For the rest of the paragraph he talks about how fast and adaptable Alonso was, with no mention of Michael - however, since he started off talking about outright speed (which he said Alonso might lack slightly compared to Schumi) and then moved on to speaking of Alonso's adaptability and consistency, I would put forward that it might be intended to suggest those were areas he could make up for his outright speed relative to Michael. I'll try to read over your previous post and put together a thorough response to it. I do believe you're wrong, and I don't think Michael was ever on another level to Alonso, but I'll need to think of a better way to rebut it than just that feeling. This sort of blanket assertion has no place in the sort of proper debate you seem to want. What is 'a good measure?' Symonds certainly never says that. And in all honesty, I think there is plenty to attack about your post in terms of objectivity. Many of the points you raise in favor of Schumacher are complete intangibles - you think he was capable of an extra level and say Alonso never was, but there's plenty who'd disagree with that, and I'm certainly one of them. What did he show in 2006 akin to Michael rope-a-dope dummy at Imola, or the nearly pulled off undertake at Bahrain? Again, it was the mirror reverse at Nurburgring and the difference between the races was clear. I'd say Alonso's best race that year was Hungary, but of course that was on Michelin wet tyres in the fastest Michelin car, it wasn't exactly a Spain '96 performance. I'm all ears. Additionally, the idea that Schumacher was driving his car on the limit and making more mistakes while Alonso was in 'cruise and collect' mode is something that's been around since 2006, used by Schumacher fans to attack Alonso, and doesn't have an ounce of truth in it (in my opinion). Offering that sort of factually unfounded one-sided argument is why people might have felt your post was less than objective. Tell me HOW you think it's not true. I can give an example of why it is -here is Alonso's radio transmission at Australia (you only need to listen to that clip, not the whole video): https://youtu.be/Lz2zabfNKF8?t=5m17s. It is inherently easier to stay within the margins of error when you're collecting points than when you're racing on the limit to catch up. Michael went off in Australia doing just that while Alonso radios in saying "I'm very relaxed". The risks requirements were different for FA and MS. Is it not inherent for a chaser to take more risks to catch up than the person with a points lead? Even in the second half of the season when Michael was bearing down on Fernando, he was still playing catch up, while Fernando's only job is to collect a minimum 3rd place at Bridgestone circuits, as he was the fastest Michelin car. But Alonso had some cave ins at USA and a big off at Hockenheim, while not needing to take any risks at all. Michael was many points behind with a dwindling number of races to catch up with. The risks meant incidents like Australia, Turkey, etc. But what are "errors" here? If we count those errors of Michael, should we not also count the inconsequential ones like Hockenheim (lucky for Fernando there was no wall there) or doesn't denouncing your own team's support after China count as an error? What about brake-testing Doornbos, shouldn't that be an error under pressure too? 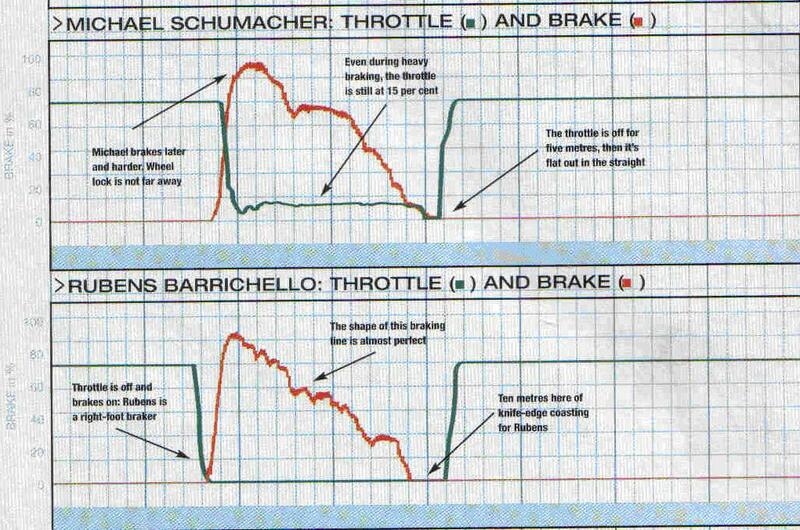 What errors on those levels did Schumacher make? Don't be quick to say Monaco qualy, because that isn't a driver error, that's what MS does with regularity, and is designed to improve his results, unlike brake-testing back markers or turning on your own team, which are raw cracks under pressure. To MS, these things are legitimate calculated actions. He did the same thing at Austria 2000 on the first corner of the race, hardly anyone remembers that though. He went off, then brought his car to the middle of the track then stalled his engine to prevent the marshals pushing his car away. It seemed that he was trying to bring out the red flag to get the race restarted! This, incidentally, is more of the "extra genius" level that MS possesses and FA doesn't. MS he doesn't "respect" the rules, he races rules like they're any other corner, track or competitor. Others play within the rules (inside the box). MS sees the rules as just a box. It's another aspect of his “greatness” in his quest to win in the sport is also what rubs most people the wrong way. That being, seeing the rules as part of the task rather than a moral standard. Some revere rules and laws, Michael takes them on. It is a philosophical superiority. 1) The 2006 cars were easier to hit the max performance level than the '10-'13 cars were, and therefore really showed the speed differences of the drivers more. 2) Felipe is a "head driver", his performances vary greatly on how confident/happy/supported he feels. He had all the support in the world in 2006 and was under the tutelage of a teammate he often refers to as his "teacher", but was really getting his head done over by Alonso's politics during the '10-13 run. on 1), the 2006 cars were packed with TC and ran on solid tyres, while the '10-'13 cars were more wiggly and had tyres that had to be conserved even in Q3, so the differences in driver performances should have been exacerbated during '10-'13, yet the pace gap was larger in 2006.
on 2), Massa was Ferrari's favourite pet in 2006 and had all the moral support in the world, but was treated like a whipped mule during '10-'13 which was affecting his head, even Massa said he was having mind management problems in a 2011 interview in the pen. On Pat Symonds's work with the drivers, I must correct you that he didn't work with MS over his whole career, only at Benetton. But he did work with FA during his Renault years. Perhaps you knew that but simply mis-typed. That being said, I wasn't using the article to prove Symonds confirms my conclusion that MS in 2006 was superior to FA in '10-'13, I was just adding some counterweight to the Appeal to Authority of citing Massa. I would concede though that in terms of consistency, FA might JUST edge it over MS (and even then, not by much), but there are many other aspects of being a better F1 driver than that, which MS absolutely trounces him on. Then allow me to elaborate. Being a better F1 driver has a few subcategories: your ability to learn, improve yourself, emotional intelligence, innovation, invention, intellectual capacity, skills, fitness, dedication, and others. 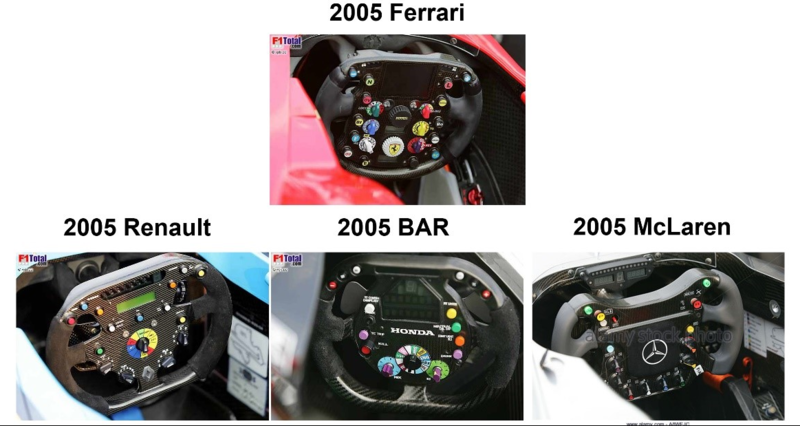 Let’s take a look at some of these for Alonso then compare them to Michael Schumacher. In a nutshell, when he was 22 he was asking his engineer for more data on his dashboard for him to analyse his own cornering speeds while on the track, so he got his team to place three new displays on his dash so he could look at them. ...to observe his rear tyres, all the while talking strategy to Ross Brawn on the radio while putting in fastest laps. Only Alonso comes close to this capacity, but doesn’t, and he lacks in other areas of expertise to Michael. So that’s another aspect of becoming the "better" F1 driver, which contains the talents of intellectual capacity, invention, and innovation. Another is revolutionising the driving styles of the whole sport. In his first couple of seasons, he was the first to change the way for F1 drivers to drive the car into the modern era and change the way F1 cars are built. This was when he brought back left-foot braking to F1 while everyone else was still heel-toeing. Eventually everyone else copied the Schumacher way of driving and all the teams later adopted his pedal set up (and in a way that then made him look less special as everyone else followed his lead) and today you have 20 drivers driving the Schumacher way, driving Schumacher wheels, most of them having grown up through the formulas with what he created. All the other drivers have done since MS is race HIS formula and achieved the results they achieved within that formula. I liken it to Schumacher being Michael Jackson, who invented a whole new dance style, invented music videos, and revolutionised the pop genre and placed his own huge mark on the industry. While Others like Hamilton and Alonso are like Usher, who came along and borrowed a lot from Jackson and could even dance like him, but they were all just dancing Michael’s dance. This aspect of MS' 'greatness' in his quest to win include innovation and personal driving improvement, and a large amount of lateral thinking. At this point I’m hastened to say that as good as Hamilton and Alonso are, they didn’t revolutionise anything in the sport during their tenures like Michael took a continuous lead in doing (at least in his first career). This makes them not as good as Michael Schumacher. For further reading on MS's team building, I highly recommend James Allen’s book where he goes into depth on Schumacher and team building/management while at Ferrari. So what about speed? Even if not the most important aspect, that’s still central to an F1 driver. Well it appears Schumacher is faster as well. Michael Schumacher is a polymath, and in a strange way his other talents made him look slower than he was. Also ironically, it is things that make popular consensus think Schumacher is slower that confirm to me that he is actually faster: His second career, and Rubens Barrichello. Rubens made Michael look slower, and in turn Michael made Rubens look slow. Neither are as slow as they seem. It’s a tad unfair to look slower just because you were much faster than a fast driver, but that’s the nature of F1. Rubens was fast before Michael and was fast after Michael when apart from a shaky acclimatisation process to Honda, was as competitive with Button at 37/38 and fat, as Alonso was recently (Jock Clear says it was only Rubens’s laziness by 2009 that stopped him winning the WDC that year, not his ability (viewtopic.php?f=3&t=12995#p602250).) I'd add lack of Brembo brakes to that top. That would more likely put Rubens in his Ferrari years as on the level of JPM, Kimi and Alonso during the same period, excluding a poorer 2005. I said the other confirmation of Schumacher's speed over Alonso was his second career. He took a couple of years to get into the swing of things but by 2012 he had about the same advantage over Rosberg as Hamilton had over him. At 41-43 and 3 years away, he definitely wasn’t as good as before. Mark Hughes describes his reaction time struggles in the car here http://news.bbc.co.uk/sport1/hi/motorsp ... 037790.stm and Ross Brawn also admitted Michael’s reactions couldn’t keep up with what he used to be able to do anymore (sorry I don’t have a link for that one though). So why does this make him faster? For Schumacher at 43, slowed reflexes, lingering brain damage from his motorcycle shunt which slowed his reflexes, stifled his motor functions further and reduced blood flow to the brain (https://www.thinkspain.com/news-spain/2 ... irms-medic), and couldn’t use the simulator for practice like Nico because it made him sick, to have about the same advantage over Rosberg as Hamilton did at 29-31 y/o is a graphic demonstration of his speed superiority over everyone else – Hamilton will NOT be this fast when he is 43, let alone with brain damage. He will suffer the same declines as Schumacher and will be nowhere near his prime level. 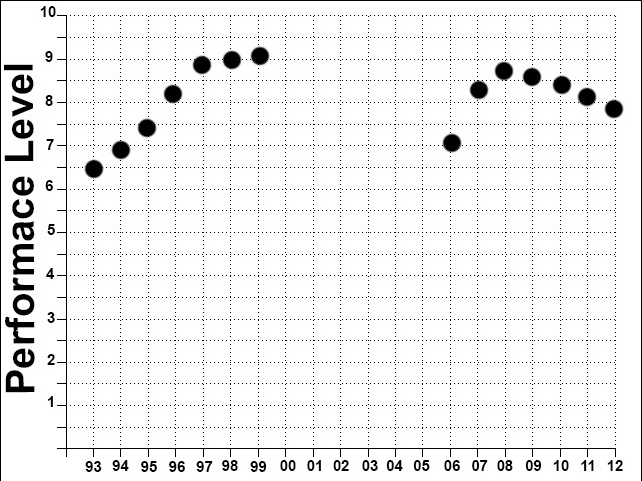 Some point out that others have been competitive in their 40s, but not in this era they’re not. 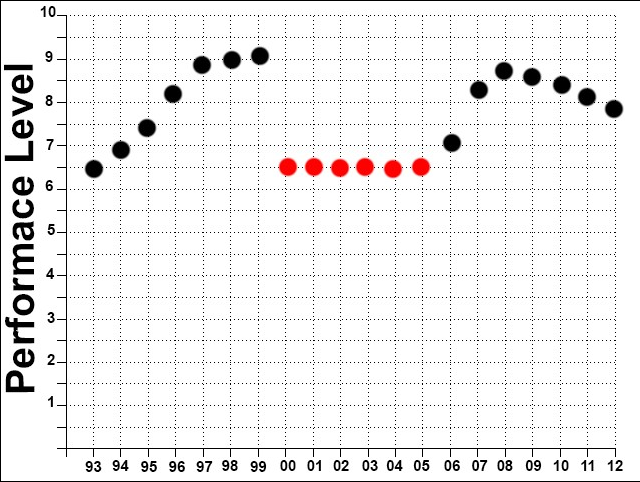 There hasn’t been a competitive 40+ year old in F1 in over 30 years (bar Mansell who was slow). That’s because this past few eras of F1 cars have been a young man’s sport, gone are the days when Brabham or Fangio can do anything quick with these cars in their 40s. Michael Schumacher has the distinction of being the only 40-something driver to be able to do this in modern F1. Let’s talk about MS's weaknesses. It’s only fair. It seems that depending on the situation, Michael chooses to take too many risks at the wheel rather than play it “safe”. He did that in 2005, the last few races of 2004, and his second career. If there is a commonality in those, it was a driver used to being at the front, finding himself further down with little to lose but to throw it around a bit more and see what happens, but I admit I’m guessing on that one. Apart from 2003, he makes less mistakes when there is a championship at stake (looking at all his 10 championship challenges as a whole) than when his is in an inconsequential situation. He even did it at the ROC when he spun off pushing too hard at the final corner in an inconsequential final race when all was lost, or the last corner of Imola 2005 when he locked up. It’s hard to quantify which side of risk/safety coin is better really, because Heidfeld was a metronomically safe pair of hands but didn’t have that extra push when he needed it, so who knows which has the best net benefit. Would Montoya be any good if he wasn’t on the edge to the point of being error prone? 2003 was Michael’s worst season and that has to go on his watch, but the other way of looking at it is Michael in his worst season still beat Kimi in his best season, so his net talent is his net talent. How that compares with the others, I’d say Alonso is the least error prone of the 2, but honestly Heidfeld beats them both on that one. All hail Nick Heidfeld! (joke). - He purposely spins in FP1&2 practice to explore the limits of the car. - He’s made "lawyering" a thing in F1 (although Ross Brawn deserves his share of credit for that too) by pulling stunts like taking stop-go penalties after the race. It has got to the point where it is today part and parcel of the political shenanigans of the teams and drivers in the sport. Team building – inferior to Schumacher. Alonso gets toxic during the hard times and isn’t a leader. Innovation – FA has done little to nothing of note to innovate the sport (certainly I can’t think of anything), just like 99.9% of other F1 drivers haven’t. Long term emotional intelligence – Alonso’s bed that he’s made for his career has been well documented and Brundle’s tweet after Hungary alluded to it. So all these factors contribute to Schumacher being the better driver by a wide, wide margin. Sure there may be faster drivers than him in the future (although Alonso and Hamilton aren’t the ones, maybe Max will become the first) as young drivers are prepared earlier and earlier and sports science continues to improve. But whoever becomes faster than Michael would need to make a mark on the sport that transcends the speed, or be light years faster than anybody. One other person has changed the sport like Schumacher, that was Jackie Stewart. But his safety campaign makes him great in a different way. Going back to the Michael Jackson analogy - Usher, talented as he is, may be able to moonwalk as well as Michael Jackson, he may be able to sing as well as Michael Jackson, but he ain’t no Michael Jackson. This comparison between Alonso and Michael Schumacher has been made for years and it totally misrepresents the difference between the two. To say FA is on the same level (let alone better than Schumacher) is not only wrong, it is wrong to the point of absurdity. Alonso may be able to turn a wheel as well as Schumacher, he may be able to feather a throttle as well as Schumacher, but he is certainly no Michael Schumacher. Apologies for turning your post upside down, but I'm going to begin with this section, because I feel it highlights the crux of our disagreement. You seem to be debating Michael Schumacher's legacy relative to Fernando Alonso, whereas I am not. If two people are in the same debate and are not actually debating the same point, there is very little chance for a reasonable conclusion. If you want to say that Schumacher is a 'greater' driver than Alonso within the scope of F1, I think that would be hard to argue with. But a greater driver is not the same thing as a better driver, and I believe we are discussing expressly which of the two is the best - that is to say the fastest, the most talented, the most effective at his chosen discipline. Schumacher's legacy is untouchable, and there is now no chance that Alonso will match it (although I believe he could have, if circumstances had been other than they were). But Schumacher's legacy has no bearing on whether he was a better driver than Alonso: there is very little doubt that Nico Hulkenberg is a technically superior driver to what Juan Manuel Fangio was in every way. His technique is surely far better, he's been driving cars since he was a child; what he knows about vehicle dynamics, slip angle, throttle techniques - everything - is in another world to what any driver from the 50s could have known. But he is not a greater driver, or even mentionable in the same sentence where legacy is concerned. One is a great driver, whereas the other is simply the better driver - in the case of Hulkenberg, largely due to the march of time. I freely acknowledge that Schumacher is a greater driver than Alonso in the historical reckoning of F1. It is, however, not what I am debating, and I will concede the points you raised that amount to that effect. What I am debating against is the idea that Schumacher was technically superior to Alonso - that he was the superior driver over the course of a given season, faster and better able to take his car to victory, as is the goal of all racing drivers. You were comparing Schumacher in 2006 against Alonso between 2010 and 2013, not Schumacher in 2006 against Alonso in 2006. And when you include those years, I think there are definitely moments: the first I would bring to mind is this battle at the Canadian GP with Hamilton, where Alonso realizes in a split second that Hamilton is attempting to slow down before the DRS line to get the benefit - Alonso reads the situation perfectly while racing at speed, drops just enough speed to stay behind, and gets the DRS benefit anyway. That's an example of Alonso's thinking and awareness in the car, and I consider it every bit a match for Schumacher's. As for simply exceptional drives from Alonso that demonstrate a level above other drivers, how about his first victory, Hungary 2003? He out-qualified his teammate by over a second and lapped him in the race, and completely dominated his rivals, including the ones on the same tyre and in faster cars (McLaren, certainly). I think you're assuming the chasing driver is under more pressure, whereas I would say it's simply different pressure. The pressure of chasing a rival - especially on track - is a positive pressure that you can build off of, gaining morale and confidence every time you can see that you're getting closer or they make a mistake. In contrast, the pressure of leading a race is a slow, grueling sort of pressure that doesn't lend itself to finding new levels. Lewis Hamilton said recently that he would rather be the chaser than the chased; he feeds off the adrenaline of hunting a rival down, and doesn't like the experience of leading from the front. It is pressure, just a very different and less emotionally useful sort. You make the case that Alonso was making errors while not under pressure compared to Schumacher's errors under pressure, but I would say that both were making errors under pressure: for Michael it was the pressure of taking the lead, whereas for Fernando it was the pressure of keeping it and not making any mistakes. When you know all you have to do is make no mistakes you're not driving at the limit: that was how Senna crashed in Monaco from a 50-second lead. A chasing driver with only the objective of going faster is completely in the zone, driving at the absolute limit, whereas a driver trying to protect his lead is the most vulnerable - he is not driving at his limit, and thinking more about mistakes than pushing. I'm going to have to disagree with you quite strongly here. I do not consider this behavior a strength for Schumacher, and it's the only mar on his legacy. No, it isn't cracking under pressure, but it is dirty driving, and it diminishes the greatness he otherwise possessed. That you can call it a greatness is baffling to me. Anyone can cheat: it doesn't make you great. The rules are not part of the task to overcome: they are the framework of competition. I think Schumacher - along with Senna and Prost - deserves to shoulder a huge portion of the blame for how the once-great standard of F1 has been reduced to the point where people will applaud Verstappen for overtaking off track and shout down the stewards for giving him a deserved penalty. Appeal to Authority is logical fallacy, not an exclusively scientific one (https://en.wikipedia.org/wiki/Argument_from_authority). What makes it a logical fallacy is that just because someone in authority makes a claim, it doesn't make it more valid than a claim from someone not in authority, if that other claim is informed and reasoned. F1 is littered with pundits, drivers and insiders making claims and predictions which disagree with each other and/or get later proven to be wrong (e.g. Kimi is the fastest man in F1). My linking to Pat Symonds was supposed to show that Massa isn't the only word on the MS/FA question, and I believe my logical arguments prove him wrong. You are correct that if you had the same information as Massa your opinion would be just as valid. However, in dismissing Massa's opinion outright because it disagrees with your own, you are committing a logical fallacy at least as poor as mine. If you cannot address why Massa would make the (in your opinion incorrect) assertion that Alonso is the better driver, you have no grounds to dismiss it. On Pat Symonds's work with the drivers, I must correct you that he didn't work with MS over his whole career, only at Benetton. But he did work with FA during his Renault years. Perhaps you knew that but simply mis-typed. You are completely correct, and I honestly don't know why I said that. I know Symonds never worked at Ferrari. But that reinforces that Symonds doesn't actually have first-hand knowledge of either driver at his peak, or Senna either (as he freely admits on the latter): he saw Michael at the start of his career and when he won his first championships, and Alonso at the same period, but he never worked with either driver at the peak of his abilities. His opinion is therefore that of an outsider, unlike Massa, who actually was teammates with both drivers in the years being discussed. We would both apparently rate Michael higher in terms of the intangible of building and maintaining a team around himself, but that's where it ends for me. I believe Michael was more of an innovator and an agent of change in F1 than Alonso, but I don't believe it makes him a better driver. The pioneer develops the techniques, but those who come later master those techniques and surpass him at his own game: that's how the world has always worked, and F1 is no exception. Alonso does all the things Schumacher brought to the sport, and I don't think you can demonstrate that he does them any less proficiently. In terms of legacy it surely stands in Michael's favor that he was the innovator, but in terms of who is better able to extract the ultimate performance from a race car it doesn't matter at all. What other talents made him look slower? Building the team around him didn't make him look slow. Cheating didn't make him look slow. Certainly left-foot braking didn't make him look slow. Your other points are well defined, but I honestly don't know what you're going for with this one. Rubens was not as competitive with Button as Alonso, or even close - I don't know how you can make that claim with any seriousness. Barrichello was only better than Button in one whole season together, and never looked quicker than him by any appreciable margin. By contrast, Alonso was always faster than Button: in 2015 it seemed close, although the unreliability of the car made that year difficult to read, but in 2016 he dominated Jenson. I agree that Rubens was a better driver than many give him credit for, but to say he was equivalent to Button is not true. Button started to crack under the pressure of leading the championship in 2009 (that pressure of maintaining the lead, again) and was slower towards the end, but Barrichello couldn't beat him even so. I can't accept this statement at all. You have absolutely no objective data in support of it, and by your own admission it's just your own impression of Rubens' speed. There is nothing from Barrichello's career to suggest he was at the level of a top driver, and the only reason to suggest he was would be to elevate Schumacher to unrealistic levels of performance. I could as easily claim that Massa was simply poor in 2006, at his true peak between 2007 and 2013, and past it by the time he partnered Bottas, thus proving Alonso's greatness. But I wouldn't, because that's not a reasonable argument to make. Schumacher was closer to Rosberg than many people give him credit for, but he wasn't the same as Lewis. I don't have the time (this post has already taken over an hour!) to calculate my own qualifying average, so I found one on this site that claims +0.083 seconds for MSC in 2012. It's believable to me. Lewis' final advantage over Rosberg was somewhere around -0.180 seconds (pokerman would know exactly), so that means Lewis had an average advantage over Rosberg that was more than two and a half tenths over Schumacher's slight deficit. That's not the same, in F1 terms: that's a lot faster for Lewis. I actually agree that 2012 shows Schumacher's greatness, in that he was still anywhere close to the leading pace in his forties. But he wasn't as quick as Hamilton, and he wouldn't have been as quick as Alonso. He had lost speed, he did have potentially significant brain damage, and he simply wasn't as quick as he used to be. One last point, before I sign off: I haven't addressed your points about Massa's speed difference to Michael in 2006. I would put it chiefly down to Massa's first season in a new team and a top car. Massa was still very inexperienced at the time, and there has been ample proof before and after that a driver is not usually at his full pace in his first season with a new team - almost every driver where there has been a second-year benchmark has improved compared to his first season with an established teammate. I believe that accounts for why he had such a large gap to Schumacher in 2006, and a lesser one to Alonso later in his career. By the time Alonso joined the team, Massa was extremely established and comfortable with the team. Very good posts from both of you. A few points, if I may. But firstly, for full disclosure, I've always been a fan of Schumie, although not a blind one. I know his weaknesses and recognise his ruthless behaviour at times. In addition, although I do not declare myself a fan of Alonso, I'd be blind or a liar if I did not recognise that he is truly one of the most complete drivers we've had the pleasure to watch and we should be grateful. Schumacher's legacy is untouchable, and there is now no chance that Alonso will match it (although I believe he could have, if circumstances had been other than they were). This should work both ways. If you want to count Alonso's "could have had" wins, WDC's, etc. under different circumstances, then you should apply the same to Schumacher. This would have brought him a potentially 10 WDC's, if not 11. What I am debating against is the idea that Schumacher was technically superior to Alonso - that he was the superior driver over the course of a given season, faster and better able to take his car to victory, as is the goal of all racing drivers. I think this was true, up to a point. Schumacher had an apprenticeship as a mechanic and understood a lot about the car. This would have probably helped more in his earlier years, before the cars started becoming depended more and more on electronics. This is my view of course, but the example of him telling stuff the engineers and adding speed dials, etc. points to that. Of course, Alonso came into the sport at a different time, where this wasn't needed. So I don't think it is a fair comparison. I think Schumacher - along with Senna and Prost - deserves to shoulder a huge portion of the blame for how the once-great standard of F1 has been reduced to the point where people will applaud Verstappen for overtaking off track and shout down the stewards for giving him a deserved penalty. That's a tad unfair. There was a book (can't remember the name, writer, nor date, so the joke's on me I guess!) describing all the little ways teams and drivers were cheating in motorsport. Basically in every little opportunity they could. Senna, Prost and Schumacher just did stuff in front of the cameras, that's the difference for me. I remember Irvine's interview saying how he ran someone off the track to teach him a lesson. These things did happen. And while the trio mentioned above shares a big part of the blame, let's not forget that the once great standards of F1 had already seen Fangio illegal wins by having more people on his pits than allowed or being pushed back on track by the audience, led shod brakes, etc. When competing, people trying to get an unfair advantage is always going to creep up some way or another. Thankfully, it is the minority. Now it would be unfair to mention all the negatives of Schumacher without doing so for Alonso. I am not taking any joy of digging mud for someone, but we need to be fair. He's been embroiled one way or another, in two of the biggest scandals of the sport. The Spygate and the Crashgate. Spygate had email exchanges between himself and PDLR discussing the stolen set-ups of a rival team. And Crashgate, well, Crashgate is hard to prove of course. But everyone in the paddock new something was off the moment he was called in the pits so early in the race. It is unimaginable that he didn't either know or get at least suspicious. And it shouldn't matter how much he declared his innocence; if Schumacher gets flak for the "option 13" without hard evidence that he used it or was aware of it, then the same standards should be applied to Alonso. Let's add to this his notorious tendency to throw the toys out of the pram, even going against his own team. On the subject of his own team, the case of blackmailing his own boss for good measure; in fact, he blackmailed Dennis while he had already leaked the emails of the stolen Ferrari data to Flavio!!! Alonso has demonstrated a nasty side too, make no mistake about it. It just wasn't on the track. You should apply your Symonds logic to Massa too then. You claim Symonds didn't have first-hand knowledge of both drivers at their peak, which is true. But this is also true for Massa, as in 2006, a depleted and unmotivated 37 y.o. Schumacher was hardly at his peak performance. This would make Massa's assessment just as flawed as Symonds's, right? I think you are putting too much weight into how much did Schumacher change the sport. For me he didn't change it per ce, but he evolved perfectly with it, better than anyone else. He went from the old style cars to new, more "computerised" ones, changes with refuelling, grooved tyres or slicks, manual gear boxes to semi auto, etc. He always stayed on the top; this for me is his adaptability that made him great. He did have his input of course, played his own little part in this big F1 machine. I'm also with Exediron regarding Rubens. He was at best a tier 2 driver. Nothing more. He was able to match MS on his day, but that can be said about any driver, any athlete really. Anyone on their day can show great stuff. But if that day is twice a year, then it doesn't account for much. RB, much like Webber, DC or even Ralf, were proved race winners with some truly great performances. But they never had the consistency to take the fight through the whole year. Regarding his slowed reflexes, there was this article that explained (I think it was Brawn) that his reflexes were nothing special. Very ordinary in fact. So I don't know how this plays within your assessment of his motorbike shunt prior to his comeback; just wanted to add it. Claiming that Hamilton will not be as fast at 43 is a bit of a reach; we don't know that. Maybe Lewis's top performances will last for a long long time. We just don't know, we only have hindsight for Schumacher versus a driver who's still competing. Finally, Schumacher wasn't infallible ("making less mistakes when there is a championship at stake"); in fact he was known somewhat as a choker... We discussed this recently in a thread in this forum. Added value: the moondance wasn't "invented" by Jackson, it was "invented" by a guy in the 50's or 60's I think. Bill Bailey in the 50's although similar moves were being done by mime artists well before that. Jacko saw Jeff Daniel do it and got him to teach him it. Thank you QI (I remembered it because of the same name as the comedian)and Soccer AM because I think Daniels was on it. (Someone was anyway that talked about Daniels teaching him it). That's fair. I conceded that Schumacher's legacy was greater than Alonso's anyway, but I do think almost any driver could have achieved more than they did with the right circumstances. Schumi came pretty close to maximizing his haul, though, unless you count the possibility that he didn't retire in 2006. He could have won 1999 if he didn't break his leg, but that's about the only one I could see giving him that he didn't actually win. As for Alonso, he certainly does hold some responsibility for his part in Spygate, but not any more than a lot of other people in the team. Blackmailing Dennis was a dark stain on his career, probably the most significant to my mind. I don't believe he was part of planning Crashgate, but I agree he must have suspected what was going on. While maintaining your silence in the face of a crime is certainly a crime in and of itself, it is lesser than actually planning and executing it. Either way, neither speaks highly of Alonso's moral fiber, I admit. 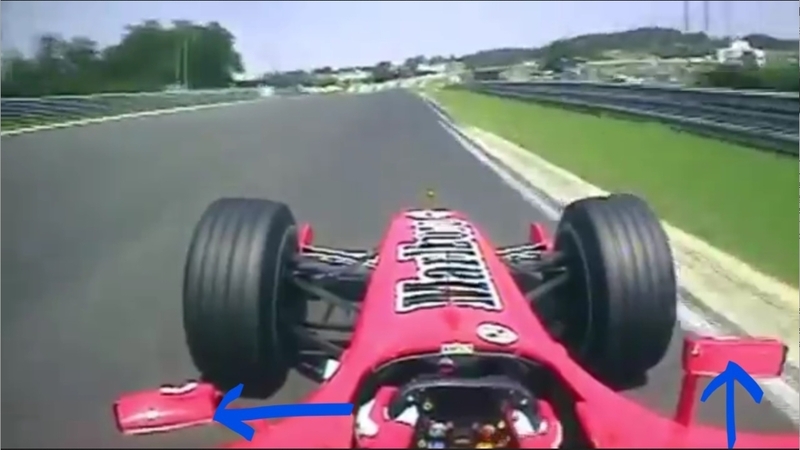 The difference is that myattitude was trying to claim this cheating by Schumacher as an active strength on his part, which I was challenging. I would never claim Alonso's complicity with cheating as a strength for him, so I don't think it's quite the same. Also a fair point, but I think Schumi was a lot closer to his peak in 2006 than he was in 1995 - although perhaps not more than Alonso was in 2009, by which point he was in a very strong patch of form. It is true that Massa saw the best of Alonso and maybe of Schumacher, which I agree should be factored into his opinion. Alonso from 2010 to 2013 was definitely at his peak. Don't get me wrong, I wasn't comparing legacies. If nothing else, Alonso's career is not over yet so it's not a fair task; he may bag the Indy 500 next year and why not, compete for the F1 WDC again (although the last one is looking all the more improbable). That's why I said that the difference is that they did it in front of the cameras. Although in my mind, there's still a difference, deliberate vs reactive. I'll leave alone the deliberate acts of cheating by the teams with extra fuel tanks and the lead shot brakes. What I mean is that it's one thing to get red mist a 'la the 1997 crash (I'll leave out the 1994, as it is still debatable by many) and completely different to do it on purpose like Senna did to Prost. It is also a matter of attitude; Senna would straight up "bully" the other drivers on track. Schumacher would intimidate them with some chops and would at times make his car very wide in order not to let someone pass. Prost I don't remember doing any of this. The closest thing now is Verstappen, drivers are weary of him being very feisty at the starts and try to stay out of his way, this is the impression I get. This reminds me a bit of Senna in this respect. Yeah, the formation lap incident happened twice though, so it wasn't just silly, he was trying mind games. It backfired in the end! I mentioned the option 13, as I never hear the engineers being blamed, rather people saying how Schumacher cheated his way with the filter and TC to get a WDC. It was just an example to illustrate that the drivers get flak anyway, even if they don't perform the actions (I doubt Schumacher or Verstappen took the filter out of the fuel hoses themselves for example, nor that they had any idea about it). Crashgate was indeed a lesser offence if you want, although it's hard to believe that he didn't at least get suspicious to question the strategy of pitting him and getting him out dead last on lap 12... But in Spygate he had an active role, the moment they started playing with the tyre pressures and examining the data with PDLR. Some people also think that he was the mysterious witness X.
I agree with you though, the only thing that I can give credit to Schumacher for is the will to win at all costs, but not by means of cheating. Yes, I meant to write that I believe that 2010-13 Alonso was at his peak still. As for Schumacher, I'm not sure. Definitely in 1995 he was still in the learning process, but he was hungrier. In 2006 he was experienced, but running on fumes, demotivated, not helped by all the Ferrari politics in the background either. Food for thought maybe!